Though different, there are many important and striking similitarities between the U.S. enforcement of its border with Mexico and the Israeli pacification of the Palestinian people. One such similarity is the companies involved. For example, Israel's Elbit Systems not only supplies the Israeli state with electronic detection systems along the wall of separation with the West Bank, but also won a contract to provide the same equipment on the Mexico-U.S. border. Nearly 55,000 people have been killed since 2006 in Mexico's 'Narcoinsurgency.' Drug and arms trafficking—going north and south across the international divide—are now the primary concern of U.S. military and homeland security forces and the Mexican Army. But that’s not all. Millions of undocumented migrants came to the United States from Mexico in the wake of the destruction of the Mexican agricultural sector starting in the 1980s with the implementation of NAFTA-like neoliberal policies. In Israel, military forces and industries have been largely shaped by decades of conquest and pacification campaigns against Palestinians. Israel began restricting Palestinian labor inside Israel with closure policies and the widespread erection of checkpoints in 1991. Closely linked political, economic, and ecological crises in eastern Africa have created an influx of migrants and refugees, especially from Sudan and Eritrea. Quite a bit actually, most significantly in the intertwining of Israeli and U.S. enforcement mechanisms. This is not to make an analogy between the Mexico-U.S border and Israeli pacification of Palestinian resistance. These are, at most, only loosely analogous. Hamas is not the Sinaloa Cartel and the Bil'in Popular Resistance Committee is not Los Zetas. They all, however, play a big role in what Todd Miller recently described as “the big business of border control,” a white supremacist political-military arena and multi-billion dollar market. Haifa-based Elbit Systems is a prime example of where these systems intersect. Elbit is one of two main providers of the electronic detection systems along Israel's wall of separation throughout the West Bank. It won a contract for similar equipment along the Mexico-U.S. border, a partially completed project cancelled in January, 2011. Elbit's unmanned aerial vehicles (UAVs) are extensively used by the Israeli military in the Gaza Strip and West Bank, including during Operation Cast Lead. The same Hermes 450 UAV model deployed against Palestinians was the first UAV to patrol the Mexico-U.S. border in 2004. Elbit won a $22.5 million contract in 2008 with Mexico's Air Force that included the Hermes 450 for similar arms and narcotics interdiction and surveillance missions on the southern side of the Mexico-U.S. border. Mexico's Federal Police in 2009 contracted another Israeli firm, Aeronautics Defense Systems (ADS), for their Orbiter UAV and Skystar 300 aerostat for $22.5 million. ADS too, developed its technology through Israeli military experience. Some of the police and military units tasked with combating drug cartels, including some who later joined cartels themselves, were trained by Israelis who shared their anti-Palestinian counterinsurgency experience. Magna BSP is another Israeli firm working for U.S. border control contracts. It provides surveillance systems on the Israeli wall surrounding the Gaza Strip as well as on the new barrier being built along the Egypt-Israel border. It is partnering with U.S. firms like AXCESS Technology to enter the lucrative U.S. 'border security' market. Another firm, NICE Systems (founded by “former IDF personnel putting their intelligence knowhow to civilian use and converting military technologies into communications infrastructures”), provides CCTV for notorious anti-immigrant Sheriff Joe Arpaio's Maricopa County Jail system in Arizona. 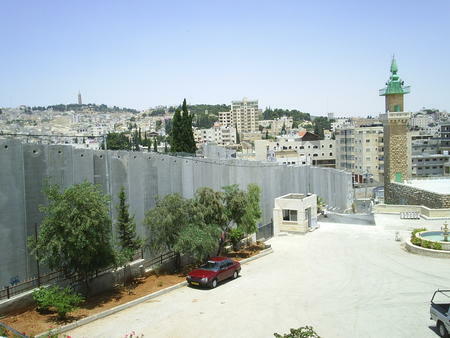 Israeli control of occupied Palestinian territory learns from the Mexico-U.S. border as well. Egyptian military engineers—tasked with enforcing the southern end of the siege on the Gaza Strip—traveled to the United States to study tunnel detection, and U.S. personnel joined them and provided equipment to assist their efforts. Israel too studies tunnel detection in the United States and has bought sophisticated detection equipment for the same use. Most major firms now operate internationally, many globally, and the U.S. is a global empire. It is thus neither surprising nor particularly interesting that the U.S. military, Elbit, ADS and Magna BSP distribute their practices and technologies to the Israeli, Mexican and U.S. governments. Boeing, Lockheed-Martin, Microsoft and others do the same. What is both interesting and deeply troubling is what exactly is being exported. 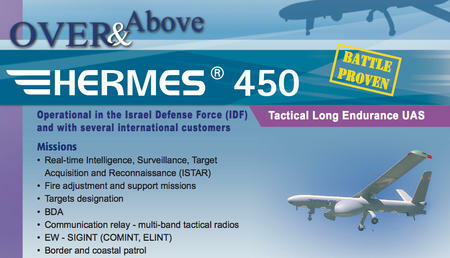 Elbit's Hermes 450 is not simply a piece of technology, it is the product of the Israeli-Palestinian relationship itself and is marketed as such with a bright yellow “BATTLE PROVEN” stamp on its promotional brochure. Israeli military technology is primarily developed for field use against Palestinians (and regional complications mostly though not exclusively stemming from Palestinian removal) and is tested and adjusted there. The battle in which it was 'proven', is the Israeli conquest of Palestine and the protection of that conquest (for example, the East Jerusalem and West Bank settlements), a battle costing thousands of Palestinian lives and most Palestinian land. Israeli and U.S. border surveillance technologies and practices exchanged between each other (and Egypt) each reflect the white supremacist polities that seek to exclude others. U.S. border 'security' policies stem from the same systemic dialogue that includes border vigilantes and attacks on migrants (or people who fit the profile). Israel's border policies with Egypt too seek to preserve an ethnocentric apartheid regime, untainted by others who, unlike the migrant laborers, enter Israel on their terms and not Israel's. Magna BSP's border technologies are produced by the same systemic dialogue that produces anti-African pogroms and concentration camps (which were preceded by similar actions against Palestinians). It is these relationships—Israeli apartheid and military occupation and U.S. white supremacy and securitism—that are being exported. Resisting and dissenting against these policies and exchanges must be done at the sites of oppression but solidarity can explore a much larger political geography. Just as Israel's technologies developed for use against Palestinians are exported for U.S. use against migrants or Mexico's subsidizing of U.S. prohibition policies, organizers for social justice can build solidarity between liberation movements. Most, but certainly not all, activists and analysts pretend that the systems—'Israel', 'Palestine', 'immigration policy'—they contest and explore are somewhat discrete, sometimes under the banner of focusing on or not diluting a cause or issue. We build borders between 'issues' and guard them, zealously protecting our turf. But the Israeli-Palestinian and U.S.-Mexican oppressive relationships are in constant conversation. Why aren't there those of us who contest these systems? Jimmy Johnson is one of over 200,000 unemployed Detroiters. He can be reached at Johnson.jimmy@gmail.com.